The future of cycling safety in Houston hinges on fully funding and implementing the city’s bike plan, making it vital that elected officials keep their promises and voters hold them accountable. The Kinder Institute for Urban Research at Rice University reports that mapping recent Houston bicycle crashes onto the Houston Bike Plan underscores the critical importance of following through with short-term and long-term cycling infrastructure projects to reduce the rising accident rates. A growing urban environment and the increasing popularity of cycling for transportation and fitness has pushed the number of serious and fatal Houston bicycle crashes to historic highs. Statewide, the Texas Department of Transportation reported nearly 500 bicycle crashes through the first six months of 2018. The good news is the Houston Bike Plan looks to be targeting some of the area’s most critical cycling safety needs, according to accident data. The study found 1 in 4 crashes happened on local streets, along mostly residential areas. Safety advocates say this is due to a lack of dedicated bike lanes on main thoroughfares, which pushes riders into nearby neighborhoods. Some 60 percent of accidents were reported on or near streets marked for future projects, while 22 percent occurred on streets already targeted for short-term retrofit improvements, primarily low-cost projects like re-striping and adding signage. Planners noted cooperation between Houston City officials and Harris County will also be critical. ABC13 reported a fatal Harris County bicycle accident as a rider attempted to pull into traffic near West Mount Houston and Ella Boulevard. The bad news is the Houston Bike Plan remains little more than a promise. 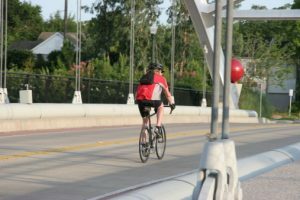 Adopted in March 2017 by the city council, the aim is to make Houston a gold-level bike-friendly city by 2027. But the city describes the plan as a “guide,” and acknowledged future funds have not been earmarked or dedicated. The Houston Chronicle series Dying to Ride examined the growing risks to riders on city streets, reporting that at least 23 riders have been killed on Houston streets in the past 5 years. The newspaper detailed several high-profile fatal hit-and-run bicycle accidents. A rider’s first avenue of compensation will be a claim against an at-fault driver’s insurance company. However, in cases of hit-and-run, or in collisions where an at-fault party lacks insurance or does not have enough insurance to compensate a victim for all losses, a rider may pursue an uninsured (UM)/underinsured (UIM) motorist claim – if the cyclist has his or her own auto insurance with this type of coverage or is covered under another household member’s policy. If you have been injured in a bicycle accident in Houston, an attorney at Smith & Hassler Attorneys At Law can help. This entry was posted on Monday, September 24th, 2018 at 8:17 pm and is filed under Bicycle accidents.